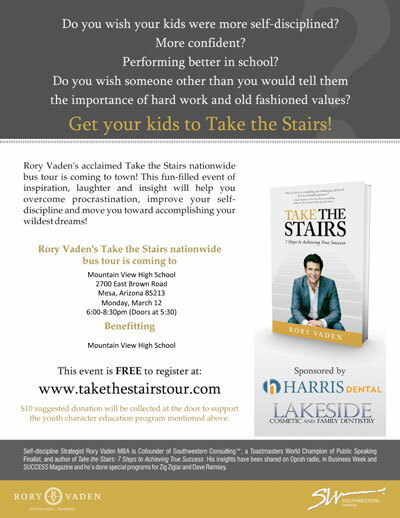 We are proudly sponsoring “Take the Stairs” bus tour with Rory Vaden. This event is good for all ages, especially those kids that procrastinate, that would like inspiration and to achieve success in their life. Come join us for a night filled with Steps for Success. Donations are requested and ALL proceeds go to Mountain View High School in Mesa, AZ. Click here to download more information on the event. To register, click here.